An elevator in “old” Steilacoom School? Someday…maybe. Those plans were unanimously approved at the District’s Nov. 14 school board meeting. 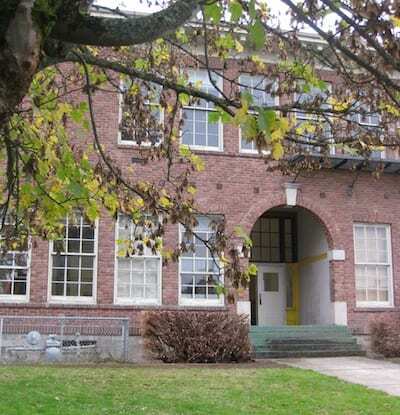 The original Steilacoom School (once housing Grades 1-8) has been abandoned (for educational purposes) since fall of 2008 after the Middle School operations transferred to the “new” Pioneer Middle School at DuPont/Northwest Landing. Since 2009 the district has used the almost-historic structure on a limited basis, housing some school operations such as technology in the structure located on Chambers street. Recently the district sold the yellow frame house on Nisqually Street that had long served as the We Love Steilacoom Food Pantry location. This past summer the pantry operation moved into the school building’s former 7th grade wing. After the school building closed in 2008 numerous community meetings were held to determine the structure’s future. Current school board member Kevin Callanan, a PMS graduate, worked to keep the district’s promise to the town. Two years ago a new roof was put on the building. Most recently asbestos has been removed from the 1915 structure. The second Steilacoom School, built in 1915 at a cost of $15,000, opened for classes that fall. Its designer was architect Emanuel Bresemann. During his long career, he designed 24 Washington schools. Read more about this local architect at www.HistoryLink.org. In the middle of the Depression, approximately 1930, E. J. returned to Steilacoom to design a second public building: this time the Community’s town hall. Renovations to the school building will be done in two phases, beginning with asbestos removal and installation of new heating, ventilation and air conditioning systems. SHSD was one of 43 school districts to receive an Energy Operational Savings Grant this past year. The District received nearly $800,000 toward the project. Phase II will include demolition of the gymnasium and removal of the 6-8 grade wings. The cafeteria will remain. A date for the final move of School District Administration offices into the site has not yet been determined. Jean Marc LeRoy of Alliance Construction Management, of Seattle, is the Project Manager. Meanwhile dozens of Steilacoom School graduates and long-time Steilacoom residents are keeping their eyes on the school on the hill. For many years a group of former Steilacoom School graduates convened every summer to reminisce about “the good old days.” Those stories, compiled by the late Jim Dyer, can be found at the Steilacoom Historical Museum.